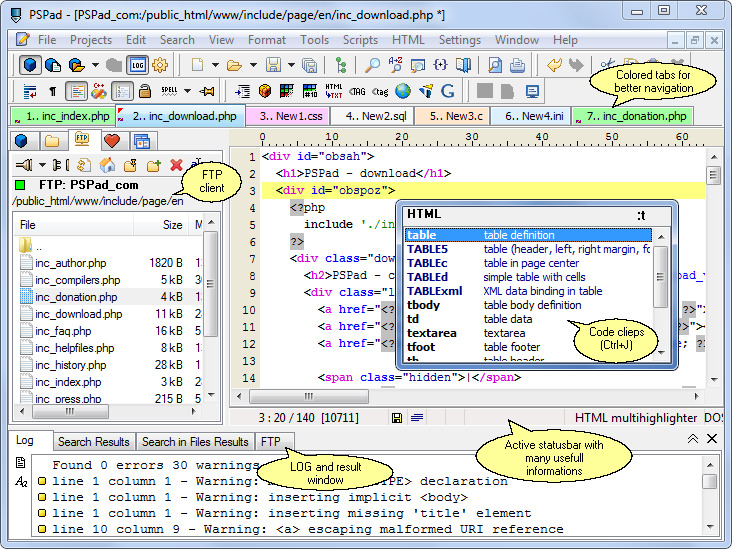 PSPad editor is a programmers editor with support for multiple syntax highlighting profiles. It comes with a hex editor CP conversion text differences templates macros spellcheck option auto-completion Code Explorer and much more. The program is pre-configured for the most popular programming languages (VB C++ SQL PHP ASP Python etc.) and you can further customize the syntax settings. 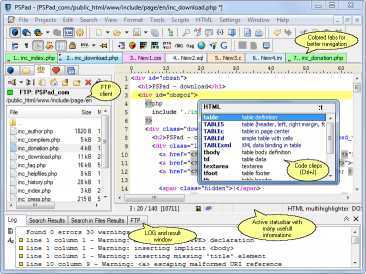 PSPad includes several additional tools that are especially useful for HTML editing (compress format code) and also integrates TopStyle Lite and TidyHTML. The program can be used as IDE for any compiler. Additional features include support for project file browsing custom shortcuts built-in FTP client to edit files on the server and much more.